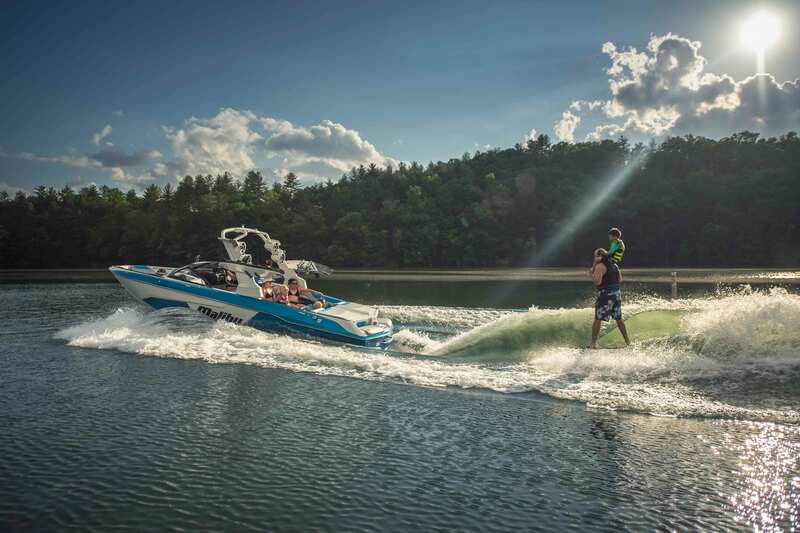 Loudon, TN | September 20, 2018 — Malibu Boats™, the global leader in watersports towboat sales, has introduced the newest model in the world’s best-selling towboat family, the Wakesetter™ 25 LSV, for 2019. The 25 LSV is the 25-foot flagship of the popular LSV line. Being the biggest, it offers the most interior space, storage capacity, ballast, as well as the biggest wake and wave. The LSV line is the best-selling series of inboard towboats of all time because of its classic traditional-bow shape, user-friendly design and awesome wake—but it’s become so much more over the years. With tech and comfort innovations you’d come to expect like wireless phone charging, a newly redesigned helm seat, a starboard locker for cooler and storage, the new Malibu Multi View Bench Seat™, and an available integrated swim step that flips down from the swim platform, the 25 LSV keeps the party going on the water all day long. With three spots for wireless charging, keep the wires at home so they don’t clutter up your space. The redesigned helm seat with leg cutouts keeps the driver in the action without swiveling the whole seat. The Multi View Bench Seat is only available on the 25 LSV and provides up to eight different positions for the ultimate in flexibility. Transition quickly and easily from a normal bench seat for cruising to rear-facing for watersports and even a table when it’s time to refuel. The 25 LSV is one of the most well-rounded boats on the water today. “With plenty of room and accommodations for the whole family, a sharp new interior look with ample billet accents and true Malibu performance and quality, the new 25 LSV is the best in it’s class,” said Eric Bondy, Vice President of Sales and Marketing for Malibu Boats. The driver has ultimate control with the new available MaliBoost™ Jet Thruster for ultimate control in wind or current to dock with ease. There’s also an optional bow camera that gives you an unobstructed view from the front, perfect for docking and trailering to and from your local ramp. With seating for 18 and just under 5,000 pounds of available ballast, the 25 LSV has enough room for all your buddies and with the multiple components of the Integrated Surf Platform (I.S.P.™) to dial in your settings, you’ve got a wake or wave worthy of the pros. The original and best in the biz, Surf Gate™ is the backbone of I.S.P. Surf Gate and puts out an awesome wave on either side of the boat without having to move any ballast. Switch your wave side in three seconds to surf your other side or transfer from side to side with ease. 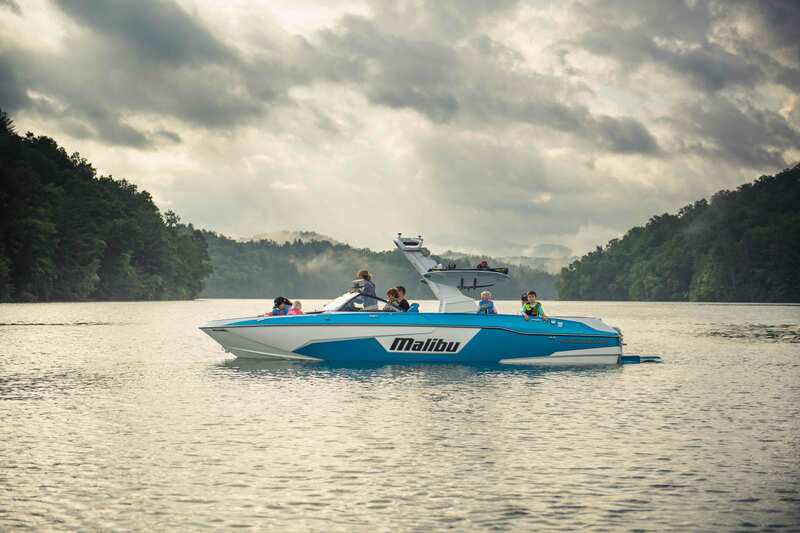 Malibu’s Power Wedge™ III is another tool of the 25LSV to make a huge wake. Power Wedge III is Malibu’s exclusive hydrofoil that pulls down the back of the boat to create a bigger wake and lifts the boat when you want to get on plane quickly or to minimize the wake for new riders. For 2019, Power Wedge III has more usable positions and five more degrees of lift to create more wake and wave options that are good for beginners all the way to the pros. Quad Hard Tank™ Ballast makes up the meat of the 25 LSV’s wake, and with new Maxballast™ L-shaped rear tanks as well as integrated float sensors in the available plug ‘n play ballast, the whole system can be monitored from the dash for precise wake engineering the competition can’t touch. Put all these I.S.P. wake features to good use while you’re riding with the world’s first and only Surf Band™. Adjust your speed, crank your tunes, dial in Power Wedge III and switch sides while you’re surfing without ever having to yell at the driver. Controlling the I.S.P. 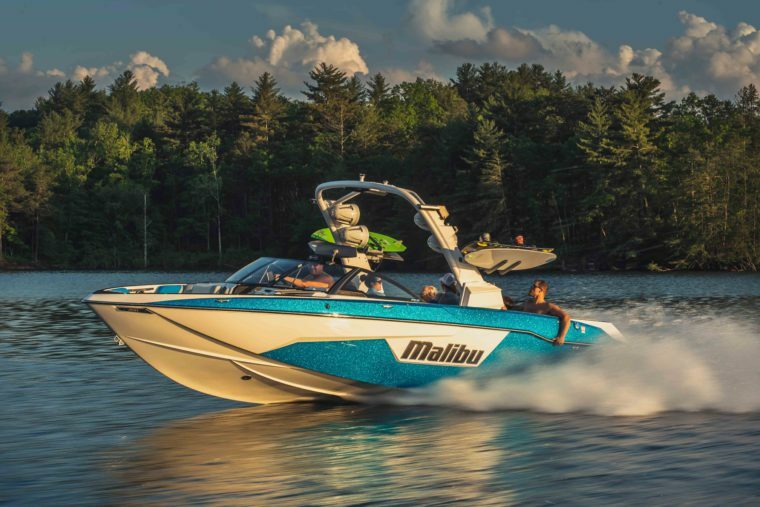 is the industry leading Malibu Command Center™, a tech marvel that allows you to simply and easily control just about everything on your new 25 LSV without leaving the captain’s chair. Speaking of convenience, the new Malibu Gx Tower™ can be automatically raised or lowered by turning a dial, even when fully loaded. Set up your Gx with a bimini, four board racks and Rev 10® speakers as well as six hoop color options, five billet color options and two tower speaker colors to perfectly match your new 25 LSV. Opt for clamping swivel board racks to free up storage space. Both the Gx and standard G3.5 towers are made in-house to ensure Malibu quality throughout the entire boat. Malibu Soft Grip material covers the flooring and swimboard to enhance comfort and function, and a model-specific, digitally tuned audio system by Wet Sounds® features multi-zone volume control along with a transom remote to maximize the listening experience. Like all 2019 Malibu models, the 25 LSV is backed by the industry’s best warranty—including lifetime hull coverage—and is available now at all authorized Malibu dealers. Call your local dealer to get out on the water today or build your custom 2019 25 LSV at malibuboats.com.